Venezuela: Cashless Society As Delays In Currency Cause Chaos – Coercion Code – "Dark Times are upon us"
Why Venezuela’s Many Crises Keep Getting Worse? The largest denomination of Venezuela’s crippled currency was pulled from circulation before the new, larger-denomination bills were able to enter it, ATMs and wallets are mostly empty, and Christmas is just a little more than a week away. Since Sunday’s shock announcement that (almost) all 100-bolivar notes were being called in by the government to combat the hoarding of currency so worthless that it needs to be weighed to be spent, the past week’s daily scenes of frustrated people crowding banks and automated teller machines to deposit the bills culminated Friday in utter exasperation following President Nicolas Maduro’s announcement late Thursday that the new money would be late. People line up outside Venezuela’s central bank to exchange 100-bolivar notes on Dec. 16. While debit and credit cards can be used at stores that accept them, buying gasoline is becoming increasingly difficult because most filling stations accept only cash. “This is terrible — it makes you feel completely impotent!” complained Wilmer Valero, a 42-year-old heavy-machinery technician, upon visiting a fourth ATM in Caracas Friday morning. “We have money in the bank, but there’s no cash. If this is what Caracas is like, I don’t even want to imagine the interior of the country,” he said before abandoning the bank to try his luck at another ATM. While Venezuela’s central bank said earlier this month that new bills — some as large as 20,000 bolivars — would start to enter circulation Dec. 15, Maduro surprised the country with the plan to pull the 100-bolivar note first. Worth only several U.S. cents on the black market, the 100-bolivar bill was the highest denomination in circulation and accounted for almost 80 percent of the value of all currency ever printed. To read more about Maduro’s surprise removal of the 100-bolivar bill, click here. With 100s now useless, and smaller bills hard to find and practically worthless because of triple-digit inflation, Venezuelans are struggling to get the hard currency they need for daily transactions in a country where 40 percent of the population doesn’t have a bank account. The credit and debit card network, meanwhile, is infamous for its poor reliability. “The new bills will enter in the course of this week, next week, the last week of December and the first week of January,” Maduro said late Thursday evening in a national address while displaying new 500-bolivar and 1,000-bolivar notes. He also cut short a final deadline to deposit any remaining bills at the central bank in Caracas to Dec. 20. Caracas-based newspaper El Nacional reported that protests were breaking out in southern Bolivar state, while Maracaibo-based newspaper Panorama reported that some looting was breaking out in Venezuela’s second-largest city and posted photos and videos of authorities deploying tear gas. 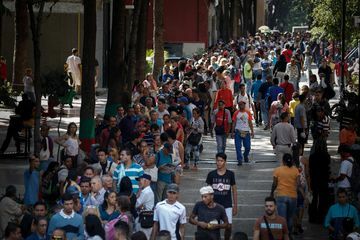 In downtown Caracas, hundreds of people, some of them elderly and disabled, waited in lines that stretched several blocks to deposit their 100-bolivar bills at the central bank before the notes become worthless. Dozens of portable toilets were set up outside as people braced for a long wait. Police and National Guard were controlling the throng pressing to gain entry to the bank, and some of the crowd departed after seeing the lines, saying they would throw the money away and take the loss. Maduro, speaking Friday afternoon, acknowledged the problems brought on by taking the 100-bolivar bill out of circulation. Carlos Palacios, a 75-year-old retiree, said he came from the coastal city of La Guaira to deposit his savings of 13,900 bolivars, which on the black market would only be worth just a few dollars. People turning in their 100-bolivar bills directly at the central bank were given a piece of paper saying that they could collect the new bills once they’ve arrived in about five days at a branch of state-run Banco de Venezuela. They weren’t given money in return. Jose Escobar, a 79-year-old retired policeman, said he had been in line outside the central bank since 8 a.m. (9 a.m. EST) and was hoping to exchange his savings of 8,000 bolivars. Next Next post: Obama Lawyers Admit Birth Certificate Forged….